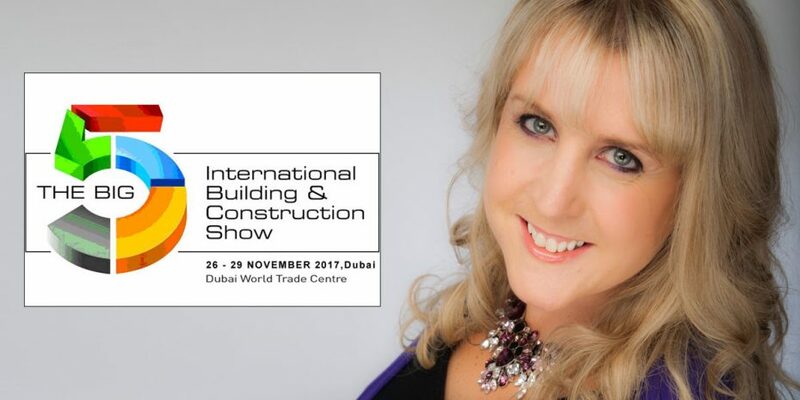 Fresh from her win as #GoDo Entrepreneur of the Year at The NatWest Great British Entrepreneur Awards, Purpol Marketing founder Denise O’Leary is heading to Dubai as a selected keynote speaker at The Big 5, International Building and Construction Show in Dubai on 28th November. The Big 5 is the largest construction event in the Middle East and is where thousands of international suppliers in the building and construction sectors network, do business and gain the latest industry insights. Denise founded Purpol Marketing in 2014 to provide specialised consultancy for marketing strategy and tender bid management specifically to SMEs with a key focus on the construction and manufacturing sectors. She will be delivering her presentation – How to Win that Construction bid, to an international audience who have travelled worldwide for the industry leading expo which is expecting an audience of 80,000 participants from 142 countries. Commenting on her upcoming keynote speaking engagement, Denise said: ‘I was requested to submit a paper on my speech topic, and was astounded to be chosen from over 550 proposals. To be selected as one of 12 business speakers across the 4 days of the Big 5 International Building and Construction Show is amazingly exciting, I love sharing our knowledge on how to win construction bids, and having an international platform means that we can expand our export activities, sharing our insights globally. Denise continued ‘The show takes place in the Dubai World Trade Centre from November 26th – 29th, and I am thrilled to be presenting on November 28th, It is such a honour to be sharing the stage with such esteemed international speakers. For more information about The Big 5, International Building and Construction Show in Dubai, see www.thebig5.ae.